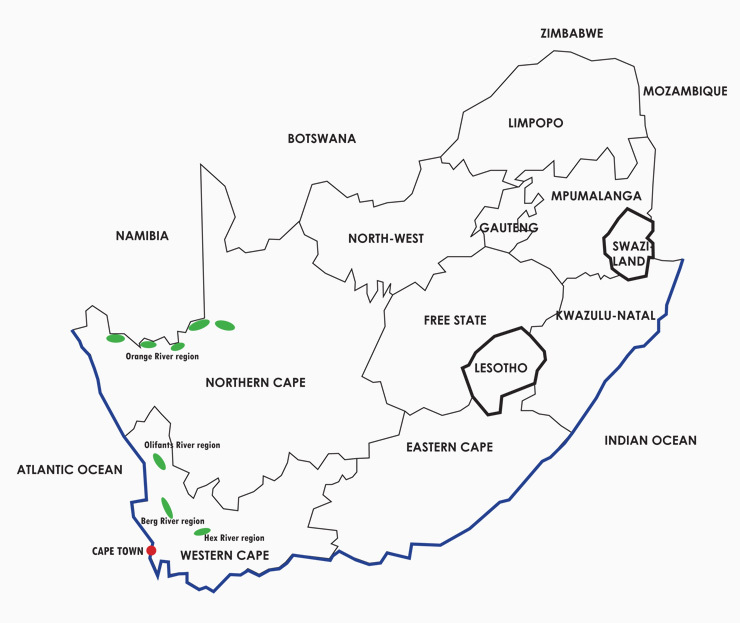 EXSA sources its table grape supply from the group’s growers throughout South Africa’s major western production regions. Our earliest production is from along the banks of the Orange River, South Africa’s biggest river. The intense desert heat provides for healthy, dry growing conditions and produces crisp, sweet fruit at the start of the harvest season. The production region runs from west to east along the river and the ripening process starts in the west and moves eastwards. This is followed by supply from production at Trawal in the Olifants River region, close to South Africa’s west coast. The river is located on the boundary between the Western Cape’s Mediterranean climate and the desert climate of Namaqualand in the Northern Cape. Although this production area is around 400km further south, the sunny climate ensures that the harvest ripening process follows very swiftly behind that of the Orange River region. The following region from which we receive supplies starts 150km further south in the Berg River Valley in the Western Cape. Table grapes are produced at various places along the Berg River which runs in a north westerly direction from Franschhoek in the south. The Hex River and Brandwacht farms are situated in the Hex River production region around 150 km to the south east of Piketberg. The Hex River is the oldest production region in the country and has produced table grapes for more than a century. The harvest from these farms provides the mid to late season supply.